Workplace health is very important as we spend a lot of time there. We speak to Prof Vicky Lambert about how we can optimize our work environments, to ensure optimum health. First of all, in order to maintain the right posture in front of your computer, adjust your chair properly. The backrest of the chair should support your lower back, but at the same time it shouldn’t be fastened firmly to let you move easily. While working with computer the best posture of your body is when your back and neck make the straight line, your feet are flat on the floor and your legs make the right angle with your knees. To correct the posture of your spine you can put a pillow under your loins. A headrest would help to release the tension in your neck muscles. Hold your head erect with a slight slope forward. Your monitor and work documents should be arranged so that you shouldn’t constantly twist your head. When you are typing, make sure that your shoulders are relaxed and your elbows are bent at right angle. If your chair has arms, they shouldn’t prop up your elbows too strongly and make you lift your shoulders too high. While using the mouse it’s very important, that your wrist, elbow and forearm lie on the table. In this posture the muscles of your shoulder girdle are under minimum strain. Besides, such posture prevents from possible arm problems. There should be enough space for your arms. Sitting motionless for a long time disturbs the blood circulation in your legs. That’s why the leg posture is also very important. Ideally a chair or an arm-chair should have a soft seat, your knees should be bent at right angle and your feet should be flat on the floor. If children use your computer, you should put a small stool under your table. When in front of a computer, place the monitor at a distance of your arm’s length. Adjust monitor brightness and contrast to make your work comfortable. Avoid any light sources producing glare. Don’t forget to make regular eye exercises to minimize eyestrain and keep your eyes healthy. 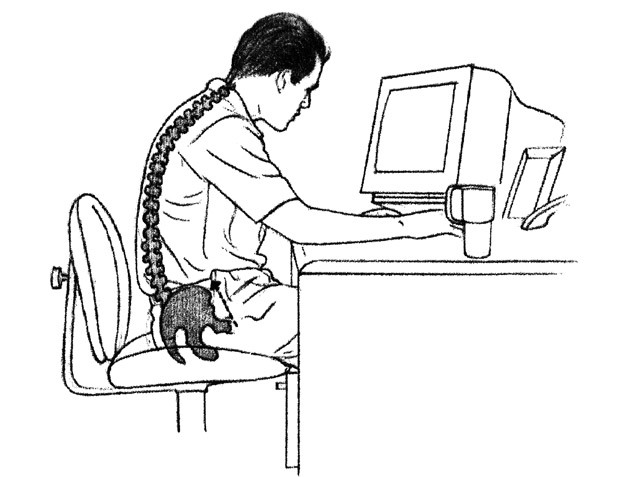 In order to avoid spine problems in the future, don’t let yourself sit in front of your pc for hours. Find time to stand up from time to time and make some simple exercises: bending, squatting – stretch your muscles. This stimulates blood circulation, which is disturbed, when you sit for too long in the same position. Do this for at lease one minute every two hours, it is enough and very healthy.